At the beginning of the month of March I was gathering my supplies together for my weekend art retreat the day before I was planning on leaving. I walked into a local Michael's store to buy a last minute supply that I needed and as I walked in, I looked up and saw a big sign advertising their "Springtime in Paris" contest. There was a contest to win a trip for two to Paris with a lot of amazing experiences included in the grand prize. My husband and I went to Paris for our honeymoon 17 years ago and we have always wanted to go back together someday. As I stood there looking at the sign, thinking about the possibility actually have the chance to do this sent chills through me. Back in November I went on a missions trip to France and spent one day in Paris before commuting to the countryside. With the inspiration from the short time spent in Paris, I was already planning on doing a piece of art based on this during my weekend away. When I saw this "Springtime in Paris" themed contest, it just seemed so perfectly timed. "Springtime in Paris it is!" I thought to myself. And then the creating began. Two weeks later I was finished and this was the final product. Many times I would play Parisian music to inspire and motivate me to work. The thought of the end goal drove me to work diligently and do my best. Yesterday the winner of the contest was announced, and it wasn't me. I was so disappointed, but there were over 11,000 entries so, needless to say, my chances were very small indeed. I have never in my life let small chances keep me from trying before though, and I intend to always keep it that way. Rejection will always be a part of an artist's life. It's inescapable. Rejection is never easy and sometimes it hurts deeply, but rejection is not always a bad thing. In a book called, The Artist's Guide, by Jackie Battenfield, it says, "if I'm not being regularly rejected, it means I'm not pursuing opportunities." I would rather take risks and pursue crazy, seemingly unattainable things, then sit here and do nothing at all. I have found that the greatest things in my life have come from taking risks. If I didn't believe that I would have never had my four beautiful boys. I think that rejection can be a good thing in the way that it pushes me to do better and helps me learn from my mistakes. Rejection is not always personal, and experiencing rejection can help you reevaluate what you identify as your self worth. I love this quote from Letters to a Young Artist by Anna Deavere Smith: "Artists are vulnerable to complicating the high that accompanies success and to getting drowned by the profound disappointment that accompanies failure (or, better said, expectations that are not met). We can confuse those highs and lows with a general estimation of personal value-- that is, by making a judgment about our value as human beings". Rejection is a normal part of life, it is how you respond to it that matters. Join a Flock and Take Flight! ... they are all doing something that they love and are radiating creativity in their own unique ways. Just by being surrounded by all of these artists in Paris doing what they loved made me want to take out my own paint brushes and pencils. It is so easy for an artist to become a hermit and to be creative in the presence of only themselves. I have a tendency to want to work in solitude. There is a side of me that would be perfectly content working in my studio from morning to night by myself. While this is a natural and comfortable way to be an artist it is not always the healthiest way to exist. I think that we as artists can benefit so much from being in community with other artists. We can learn from each other, be inspired by one another, encourage each other, and spur each other on to become better at what we do. One of my goals for this year is to do a better job at being in community with other artists. I have already chosen a local art group that I am going to join and I am really excited about it! I would also encourage any artists out there that are not a part of an artistic community to get connected as well. Think of what you could be missing out on if you don't. Think about why people flock to cities like Paris. Think about joining a flock instead of flying solo. Come on with me and take flight! In France, one of my favorite experiences was going back to Montmartre where all the artists of France seem to congregate. There were people all over the place trying to make money selling their paintings and portraits. 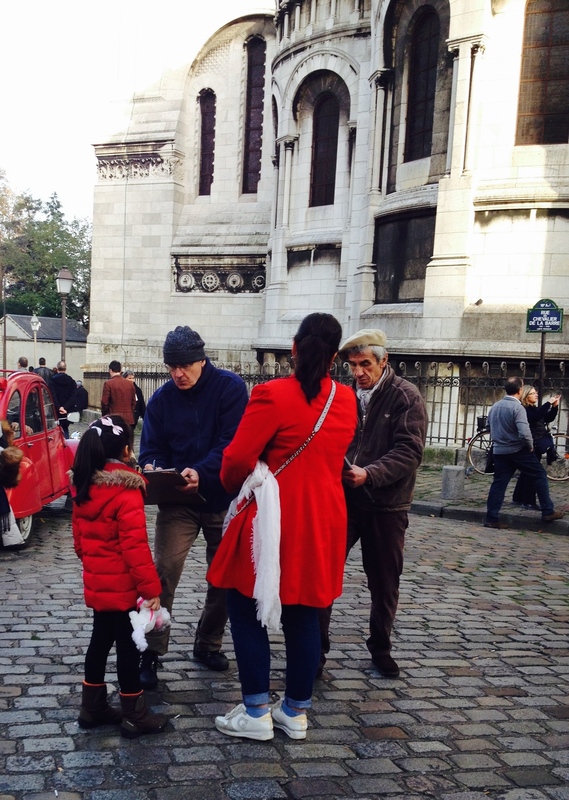 There is a square where most of the artists gather together and people come to buy a unique souvenir from Paris... a piece of original art. To me, it was a perfect example of just how different every artist is from the next. All of our minds are wired so differently and most people gravitate toward art that makes sense to us as individuals. We all can appreciate different kinds of art and even create different styles of art, but I think that there will always be something about the beauty that we create and enjoy that will be unique to how we were individually created. As we were strolling along taking in all the different styles of art, this man sitting here with the blue hat stopped us and asked my friend who was with me to paint her portrait. She told him that she wasn't going to purchase a portrait, but he insisted on painting her because she had the style that he liked to paint. My friend's beauty caught his eye because her face was a face that he could see in one of his paintings. She agreed, and he started capturing her face on paper. She may have had the kind of lips, eyes, or cheek bones that he enjoys painting. He may have enjoyed the nostalgia of her 1920's inspired hair or thought the angles of her face matched his style, who knows. What I do know is that he found his inspiration and painted something that was uniquely his style and what he thought was beautiful. He didn't look at the artist to the right or left of him to figure out what he should be doing, he just did what made sense to him. My goal this year is to keep on this journey to figure out just who I am as an artist and dig deep within to fine tune what makes me uniquely me and apply that to my art. A good friend once told me, "You have something to say that is different than anyone else's voice in the whole world." There is such freedom in expressing yourself the way you were created! 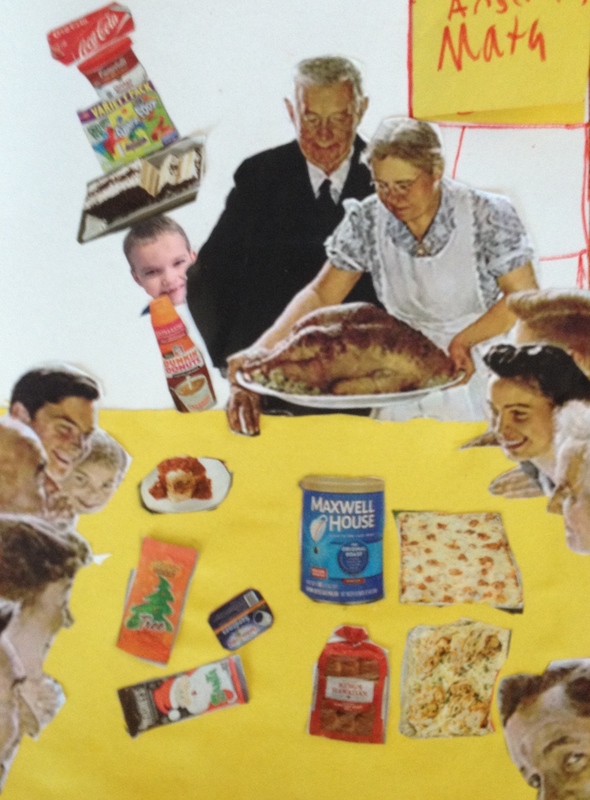 For my homeschool art class today we were learning about Norman Rockwell and I decided to let the students turn one of his famous paintings called "Freedom from Want" into a fun collage. They were able to include their own face in the collage and redesign the painting as they wished. 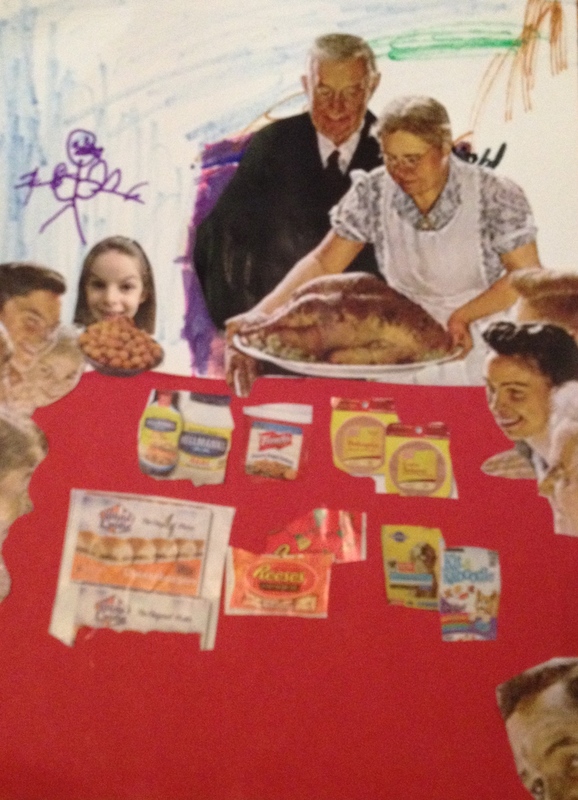 They made their own custom background and Thanksgiving feast using magazine and grocery ad cutouts. These pieces definitely reflected their personalities! 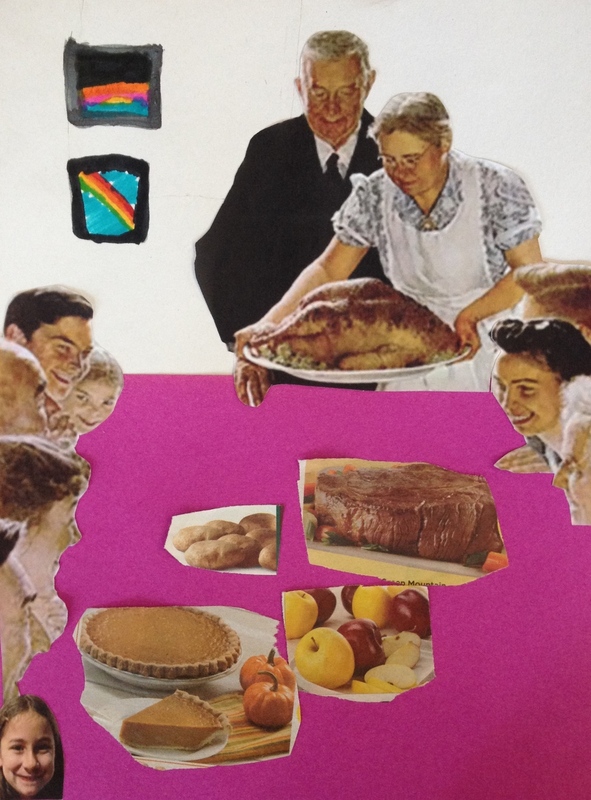 Notice the placement of their heads and choices of foods, etc. They had a lot of fun with this and I enjoyed watching them be silly with this project! This year I will not be here for Thanksgiving. In fact I will be leaving the country tomorrow as I head off for a 10 day adventure in France! I am going to Paris for a couple of days and then joining others out in the french countryside to do mission work there for a week. Getting the opportunity to step out from my everyday life here at home and break out of the norm for a little bit is beyond thrilling for me. 16 years ago I went to Paris on my honeymoon and it was an incredible experience!! Our view of the eiffel tower right around the corner from where we stayed at the Hotel Amelie. Alongside working with the missionaries in France and I am hoping that I get lots of inspiration from this trip to infuse into my art. I don't see how this wouldn't be accomplished in a place like France... such history and beauty before you everywhere you turn. Street artists in my favorite place in Paris... Montmartre! Besides leaving my husband and four children, I am also leaving a room full of wooden diamonds that have been made for our winter set. I can't wait to see all of them put together to make the snowflakes when I return from my trip!!! Later blog posts will reveal all of our hard work that went into these sets, so stay tuned. Mais pour l'instant au revoir (but for now goodbye)!!! This photo was taken 16 years ago at the Louvre on my honeymoon in Paris. I remember being in awe of seeing original paintings done by all the masters. There is nothing like seeing art in person. It is a totally different experience that you get when you see it in real life, than when looking at it in a book or photograph. I remember being so shocked to see how small the Mona Lisa was in real life compared to what I imagined it to be, and was surprised to see that Monet's water lilies filled an entire room. I feel like viewing art in a gallery is becoming a thing of the past. We are living in a time where information is available in our pockets and we don't feel the urgency to get out there and see art with our own eyes! I want to work hard to always make sure I take time to get up close to art and beauty, and see the brush strokes.